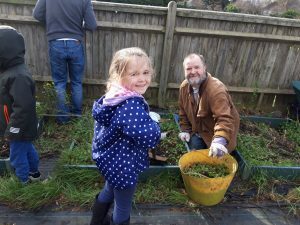 A passion to get children to go green has led to the launch of a new community garden project in West Sussex. 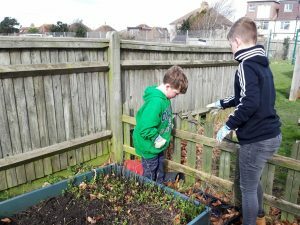 A Hove funeral co-ordinator partnered up with Eastbrook Primary Academy to launch the project on Sunday 10 March. Thanks to a £500 donation from Caring Lady Funeral Directors and a lot of hard work from volunteers, the community garden will enable the school children to plan, grow, cultivate, harvest and consume products grown within the grounds. Lucy Harvey, Funeral Co-ordinator at Caring Lady Funeral Directors, said: “For possibly the windiest Sunday known for quite some time, there was a pleasing show of parents and students for the initial garden project gathering. “We started preparing the land and planter beds, and reconstructing a former greenhouse made of plastic bottles. “There were plenty of tools to hand. The children got involved and by the end of the morning, there was a massive improvement. Now the area is ready to start sowing seeds and creating an area for Eastbrook to be really proud of and utilise to its maximum potential. Thanks to donations of tools, bottles and seeds from parents, the garden project will benefit all of the school’s children. In Reception they will be able to learn about the different parts of a plant and older children will be able to use the garden for a range of science lessons. Thanks to volunteers, it is hoped that the children can start sowing and growing as soon as possible. Julia Sherlock, Headteacher at Eastbrook Primary Academy, said: “We are very keen to use our fantastic school grounds as part of the wider curriculum. This project will allow our children to grow their own vegetables and then cook them to make a meal.